An exciting week in the world of Hex! The next wave of Alpha invites has gone out, adding 3000 more people to the testing (though still not me, unfortunately! ), Gems have been added to the current alpha client, and the Casual Hex booster raffle has ended! More on those later, though. The main thing I wanted to talk about today is the difference in balance between Constructed and Draft formats. Not all cards are created equal, and a source of confusion I often see in newer players is why card X even exists when card Y is superior in every way. There are a few reasons for this, but the primary one is that since its creation, Hex has mainly been balanced around two different formats – Constructed and Limited. For those that don’t know, lets define these formats a little. The Constructed format is one in which your deck is made from cards you own, built from your personal collection. Decks are able to be fine tuned using the very best cards that fit your deck. The general assumption here is that any given player will have access to any cards they need – obviously this isn’t going to be universally true, but Constructed is balanced around the idea that a player will be able to add 4 copies of any given card to their deck. There are a number of pros and cons to this format, but that’s an entirely different article. In Limited formats, specifically Draft in this case (though Hex will hopefully have other limited formats, we don’t have any hard details on that yet), a player’s deck is essentially made from random cards immediately before the game begins. You can’t guarantee that you will have access to the perfect cards, and building a Draft deck is a largely different skillset than building a Constructed deck. Specific to Draft, each player brings 3 booster packs – these packs are opened one by one, and each player picks one card from their pack and then passes it to the next player. This continues until all the cards from each booster are picked, and then again for each booster pack. The selected cards then form the pool from which a player will build their deck. So, reasons for the disparity between some of the cards may already be becoming apparent (if it wasn’t already), but lets look at some examples. So, lets take a look at these two Wild troops. They’re both 7ATT/7DEF, which is pretty impressive, but while the Fist of Briggadon costs 6 resources, the Gigantisaur costs 7. Further more, the Fist has the Invincible and Crush keywords! So, why would anyone use the Gigantisaur instead of the Fist? Well, in Constructed they basically wouldn’t – there’s very little reason to. 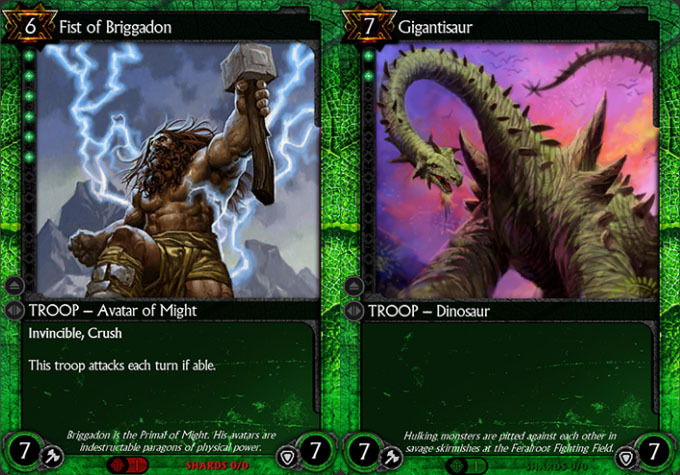 Sure, a player might not have 4 copies of the Fist – it is a Legendary, after all – and the Gigantisaur only has 2 Wild threshold vs the 6 required by the Fist – but in a general sense, and especially in any competitive scene, you would just never use the Gigantisaur when the Fist of Briggadon is available. What about in Draft, though? Well, as I just mentioned, the Fist is a Legendary card (the red symbol at the bottom denotes Legendary) whereas the Gigantisaur is only an Uncommon (represented by the green symbol.) When you are pulling from a limited pool of cards, this suddenly becomes a huge factor – there’s no guarantee that a Fist will even be in the game at all. We don’t have exact numbers on the rarity of Legendary cards yet (Cryptozoic have intentionally not said), but the current assumption is that it will match Magic The Gathering – 1 in 8 boosters will contain a Legendary. This means that, on average, a Draft game might contain 3 Legendaries amongst all 8 players. Add to that the fact that there are over 20 Legendary cards in Set 1, and the odds of a Fist appearing are pretty low – the odds that you specifically get to pick it are lower still! The Gigantisaur, on the other hand, is Uncommon. Since each booster containers 3 Uncommon cards, there are going to be a lot more of them in the Draft, greatly increasing the odds that you’ll see at least 1 Gigantisaur in there. Now, should a Fist of Briggadon actually show up, then obviously you should take that, but given how unlikely it is then the Gigantisaur is going to look like a pretty nice choice if you’re picking Wild and find yourself needing a huge troop. Blood offers us a more interesting example. The Darkspire Enforcer, Brood Creeper and Xentoth’s Inquisitor are all 3 cost troops with very similar stats – 3ATT and 1 or 2 DEF. The Darkspire Enforcer is a Common card, and is very uninteresting compared with the other 2, having no additional abilities. The Brood Creeper is an Uncommon, and has the ability to generate extra troops if it can manage to connect with the enemy Champion. A nice ability, certainly more powerful than his Common cousin. Xentoth’s Inquisitor, however, is a Rare card and undoubtedly the most powerful of the 3, even with his lower defence. With the ability to return to your hand when it dies, and a Major gem socket, the Inquisitor is both flexible and fearsome. In Constructed games, you would basically never see the Darkspire Enforcer – Xentoth’s Inquisitor, or maybe the Brood Creeper if it was more applicable to your deck’s strategy, would always be used over the vanilla card. In Draft games though, the rarity of these cards comes into play. You’re likely to see multiple copies of the Darkspire Enforcer throughout the Draft, while you might only see 1 or 2 Brood Creepers, and you might not get a single Xentoth’s Inquisitor. When given a choice, you’re obviously going to want the most powerful troop, but if you’re just looking for a 3 cost Blood troop and Darkspire Enforcer is available, it might start to look pretty attractive! Obviously when you are building a deck, either in Constructed or Draft, there’s a lot to consider, and most of it is far outside the scope of this article, but hopefully this has helped give you an understanding of why certain cards exist and why they are balanced the way they are. So, next time you find yourself wondering what the point of the Determined Zombie is, now you have an idea! As I mentioned earlier, Gems were added to the Alpha in the latest patch, and interestingly a lot of the Gems have changed! Many of the Gems we knew are gone, and a bunch of new ones have been added in their place! I’ve talked about gems before – in the broad strokes it is still applicable, though obviously many of the specific examples are no longer valid, as some of the gems no longer exist! Anyway, it’s well worth getting to know what the gems do as knowing what your options are when building a deck – especially in a Draft game where you have limited time to pick a card – will be valuable knowledge to have. For now, I’m going to go over some of the more interesting changes. For starters, half the gems now have a double threshold – all the gems on the old list were single threshold. This means that you’ll have to have 2 threshold in the shard of the gem before that gem’s ability will become active. The format of the gems has also been streamlined a little – all of the single threshold Major gems give “enter play” effects, while all the double threshold Major gems give “damage Champion” effects. All of the single threshold Minor gems make your troops easier to use, while the double threshold Minor gems make them harder to deal with. It’s a nice change which helps keep the abilities of each gem straight in your head. All in all, the selection of gems is a lot better too. Each one has a unique effect, and none of them have negatives associated with them unlike some of the gems in the old list. Some of the more problematic gems have also been dropped entirely – most notably the Resource Destruction gem. Personally I’m pretty happy to see this gone, as it would have been incredibly frustrating to play against, especially if socketed in something like the Eldritch Dream, which can’t be blocked – imagine your opponent having a couple of them on the battlefield, and your resource pool dropping by 2 every turn. How long before you were simply unable to play? Definitely glad that’s gone. The new selection of gems is a lot more interesting and ultimately this is a very welcome change. Personally I can’t wait to try out the gem that creates Rhinoceros troops every time you hit the enemy Champion! Combine some of those with Crash of Beasts and it’s Rhino-city! The booster raffle has ended and the winners have been contacted. Thanks for everyone for entering – the activity on the site has been nice to see, so I hope you will all consider continuing to comment even without the lure of prizes! I’ll certainly be running similar contests in the future too, so if you want to get a leg up then you should definitely follow me on Twitter and Like the Facebook Page in advance. Out of respect for the privacy of the winners, I won’t be posting the names of the Facebook or Twitter raffle winners here – though they are free to drop a comment below if they want to! – but the Comment raffle winner was Trent! Congratulations to all 3 of the winners – they’ll be receiving their booster packs once Hex is further along, and booster packs become available! And thanks to everyone who entered! That’s all for today. Check back next time, when I teach you how to summon your own Unimaginable Horror From Beyond, using just some flour, water and the souls of your vanquished enemies! This entry was posted in Cards and tagged balance, constructed, draft, gems by Icepick. Bookmark the permalink. Darkspire is the only orc! I would consider him if I was building a blood heavy orc deck, although shamed gladiator would get the nod first probably.